FILE - President Donald Trump speaks in the East Room of the White House in Washington, Aug. 1, 2017. That's how large the gender gap is among U.S. President Donald Trump's recently announced candidates to head U.S. attorney's offices around the country. There are 93 U.S. attorneys in the nation, politically appointed prosecutors charged with enforcing federal laws while carrying out the president's law enforcement agenda. They serve a term of four years. Among Trump's 33 nominees, all but three are white men. Jessie Liu, tapped to head the U.S. Attorney's Office for the District of Columbia, the nation's largest, is the only woman on the list, which also includes one Chinese-American and one African-American. That could change as Trump continues what has become a near-weekly wave of nominations for U.S. attorneys. Still, the glaring gender imbalance has drawn criticism and renewed focus on a lack of diversity among Trump's political appointments. "I'd hate to second guess the individual nominees and think that they're good people and good choices, but it's discouraging across the board as a group to see the fact that there is no diversity," said Joyce White Vance, a former U.S. attorney from Alabama. Ripley Rand, a former U.S. attorney for the Middle District of North Carolina, said that with one exception, Trump's nominees hail from small- to medium-sized federal districts with relatively small pools of qualified lawyers to draw from. "I think we may see a shift in diversity once we start going to the larger districts and other places," Rand said. But Vance, a University of Alabama law professor and career prosecutor who headed the U.S. attorney's office in northern Alabama during both terms of former President Barack Obama, said a lack of qualified female candidates is not a valid explanation. "In the Bush administration, all three of the U.S. attorneys in Alabama were women," Vance said. "There are talented women in law enforcement and experienced lawyers throughout the southeast, so I don't see that as an explanation." 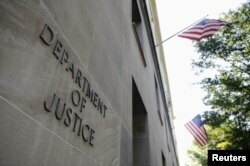 FILE - The exterior of the U.S. Department of Justice headquarters building is shown in Washington, July 14, 2009. The White House did not respond to a question about the lack of diversity among Trump's U.S. attorney nominees. While tasked with enforcing the nation's laws, U.S. attorneys are selected through a political process that starts in each state and ends with a U.S. Senate vote. While the White House makes final selections, the initial list of candidates is drawn up by screening committees set up in each state by the party that controls the White House. In Vance's case, she said she was first interviewed by a committee composed of law professors, judges and former U.S. attorneys in Alabama and later by another panel made up of the state's top Democratic Party leadership. The panel then sends its list of candidates — typically, a couple of names — to the White House, which makes a final selection. But before a nomination is announced and sent to the Senate, he or she is interviewed by the attorney general and deputy attorney general. Home State senators exercise a great deal of power over nominations. Under a century-old Senate custom known as the "blue slip" rule, both home state senators must consent to a nomination for their state before the Senate takes it up for consideration. The Senate has so far confirmed three nominees. Former Presidents George W. Bush and Obama were criticized for not appointing enough women to senior positions during their first terms in office, but by their second terms they added more women to their staff, according to Lilly Goren, a professor of political science at Carroll University. Obama's U.S. attorneys were a diverse group. There were 24 female U.S. attorneys when Obama left the White House in January. Four of the U.S. Attorney's offices that were led by women under Obama, including the northern district of Alabama, have gone to men under Trump. Trump came in for some early criticism over his appointments. According to a Bloomberg study conducted in March, women made up 27 percent of the appointed roles filled by Trump. However, he's appointed women to senior positions. His cabinet includes four women, including two department chiefs: Transportation Secretary Elaine Chao and Education Secretary Betsy DeVos. 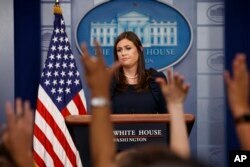 FILE - White House Press Secretary Sarah Huckabee Sanders listens to a question during the daily press briefing at the White House in Washington, Aug. 1, 2017. Inside the White House, women hold key advisory positions, including press secretary Sarah Huckabee Sanders, Deputy National Security Adviser Dina Powell, and Counselor to the President Kellyanne Conway. And at the Justice Department, Rachel Brand is the No. 3 official, while Beth Williams was recently confirmed as Assistant Attorney General for the Office of Legal Policy. The lack of diversity aside, Trump's U.S. attorney nominees have deep prosecutorial experience, either at the state or federal level. Rand, now a partner at the Womble Carlyle law firm, said the candidates' state prosecution experience is noteworthy given that a large number of violent crime cases are prosecuted at the state level. "President Trump has continued to focus on prosecution experience, state prosecution experience and experience as a former law enforcement officer, which is consistent with his executive order" for the Department of Justice to focus on violent crime, Rand said.